T o elaborate, leading educators to create technology-enhanced blended learning environments is a highly collaborative, yet challenging (and equally important) role. Instructional technology leaders (lead teachers, instructional coaches) are instrumental in cultivating blended learning environments that are rich with technology within their school and/or district, while implementing a personalized culture. Just check out this inside look at “how instructional coaching for teachers can translate into student growth,” by Diane Caldwell in the Education Week Commentary article, “A School-Improvement Guidebook: Cultivate Trust.” Diane talks about supporting teachers through collaboration, alignment of goals, and establishing continuity of instruction. Instructional coaching in the K-12 classroom can go a long way toward the often slow adoption process of full-fledged technology integration. If teachers lack the necessary support, efforts to integrate classroom tech often fall by the wayside and can turn into a partial or lackluster, non-uniform use of technology — maybe by just a couple of teachers with just a couple of devices in just a couple of classrooms. The instructional coach provides a range of support and resources to teachers around technology integration. This isn’t the tech support guy who comes into the classroom to fix the printer or install software. The coach is here to help teachers to improve practice, whether it’s using technology, trying different strategies, exploring new classroom or literacy approaches, or finding resources to support them in their day-to-day teaching. 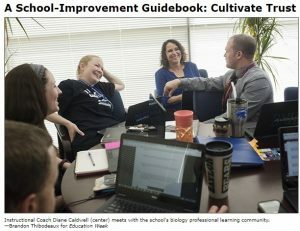 The coach also acts as a conduit of best practices, working with teachers across the school, and sharing what’s worked, what can be adapted, and how to do it. It’s important to remember that the instructional coach is not a content expert in all areas. Rather, teachers remain the content experts, while coaches bring some creative ideas, resources, and support to the table. The new upcoming course, “Instructional Technology Leadership,” developed in partnership with Wilson College, will enhance the learner’s understanding of leading educators effectively through developing and implementing a personalized leadership plan and methodology based on instructional needs data and his/her school district’s digital learning culture. Learners will explore relevant frameworks, design and teaching strategies, tools, and resources to advance their leadership efforts. This course will provide relevant and rigorous opportunities to build upon teachers’ professional needs. With collaboration from colleagues in other schools and districts, participants will deepen and expand their instructional technology background and further develop productive leadership and coaching strategies. Stay tuned for this new online course that you won’t want to miss! Eduspire is a state-wide leader in continuing education with an emphasis on technology integration and innovation.